This Villa is a house with 230 sqm furnished colonial / European style. 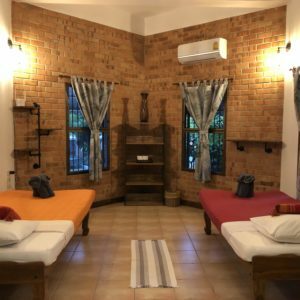 Located 5 minutes from busy Ao Nang (Krabi) and a few minutes away by car from with the peaceful Klong Muang Beach paradise. 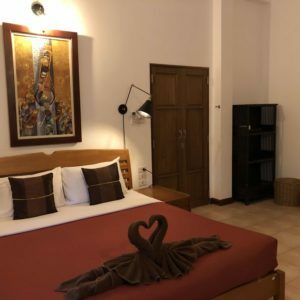 Villa Utopia has recently went thru a makeover, where a new exquisite painting was applied, as well as a new fresh lighting set, well apropriate to the surroundings and decoration. 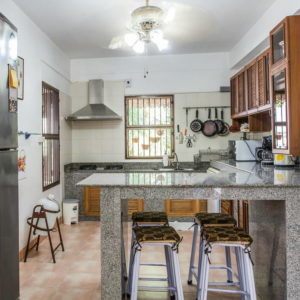 The propriety has 1000 m² with a private access road and 2 optional luxurious bungalows, Lezard and/or Grenouille, of 45 and 50 m2 respectively, fully equiped with bathroom, kitchen and terrace. A perfect option for large happy families. The ceilings are very high therefore not needing AC to keep interior fresh. Nevertheless, all bungalow rooms are equipped with large ceiling fans. Also the windows have bars for safety. The delicious private pool is treated with natural salt, no chemicals added. It’s size is 8m x 4.5m and it’s equipped with 3 Spa / Jacuzzi jets as well as mood light for the late night evening. 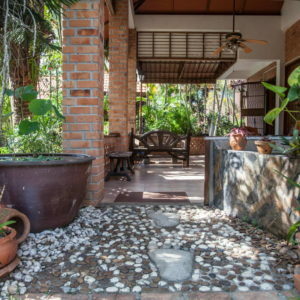 Villa Utopia is surrounded by Thailand natural beauty and one of the National Parks is right behind the house. More than often, many local species can be seen in their natural environment, such as monkeys and squirrels.